According to a study by the University of Edinburgh and Scotland’s Rural College, eating insects instead of beef could help tackle climate change by reducing emissions linked to livestock production. According to a study by the University of Edinburgh and Scotland’s Rural College, eating insects instead of beef could help tackle climate change by reducing emissions linked to livestock production. Replacing half of the meat eaten worldwide with crickets and mealworms would cut farmland use by a third, substantially reducing emissions of greenhouse gases, researchers said. 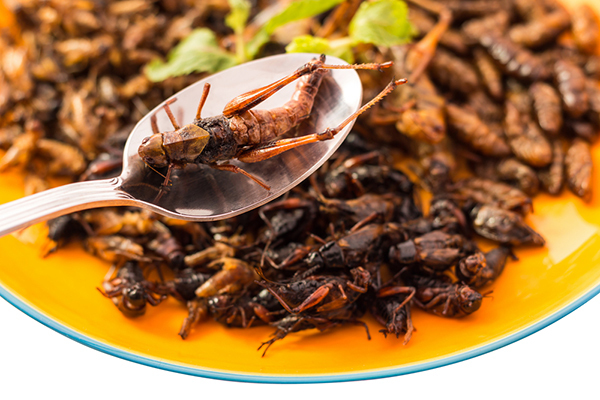 While consumers’ reluctance to eat insects may limit their consumption, even a small increase would bring benefits, the team notes. This could potentially be achieved by using insects as ingredients in some pre-packaged foods. Using data collected primarily by the UN’s Food and Agriculture Organization, scientists have compared the environmental impacts of conventional meat production with those of alternative sources of food. It is the first study to do so. The researchers considered a scenario in which half of the current mix of animal products is replaced by insects, lab-grown meat or imitation meat. They found that insects and imitation meat – such as soybean-based foods like tofu – are the most sustainable as they require the least land and energy to produce. Beef is by far the least sustainable, the team says. Similar land savings could also be made by switching from the current mix of animal products to diets higher in chicken and eggs, the team said. They found that the land required to produce these was only marginally greater than for insects and imitation meat. The research, published in the journal Global Food Security, was supported by the UK’s Global Food Security Programme and the European Union's Seventh Framework Programme. It was carried out in collaboration with the University of York, Karlsruhe Institute of Technology and the Centre for Australian Weather and Climate Research. A mix of small changes in consumer behaviour, such as replacing beef with chicken, reducing food waste and potentially introducing insects more commonly into diets, would help achieve land savings and a more sustainable food system,” said Dr Peter Alexander of the University of Edinburgh’s School of GeoSciences and Scotland’s Rural College.